Large ficus macrophylla in Villa Zirio gardens, Sanremo. Italy is the country of Art, Food and Wines, Fashion and Craft, but travelers could discover the great kaleidoscope of landscapes it embraces. From the big islands in the Mediterranean Sea, Sicily and Sardinia, to the big cities as Rome, Florence, Milan, Turin, Naples, Genoa, Bologna, Palermo, from the forests along the Appennines Crest to the beautiful historical villas in the plane around the Po river, in North Regions. Presently Italy is covered for 34% of its whole surface by woods and wooden land and it guest more than two thousand of remarkable Monumental Trees. Tiziano Fratus wrote several books about this huge Natural Heritage Capital among which L’Italia è un bosco (Laterza, 2014 – Italy is a Wood), Manuale del perfetto cercatore di alberi (Kowalski Feltrinelli, 2013 – Perfect Tree Seeker Handbook), Il sussurro degli alberi (Ediciclo, 2013 – Trees Whisper), L’Italia è un giardino (Laterza, 2016 – Italy is a Garden), I giganti silenziosi (Bompiani, 2017 – Silent Giants) and Il libro delle foreste scolpite (Laterza, 2015 – The Book of Carved Forests). 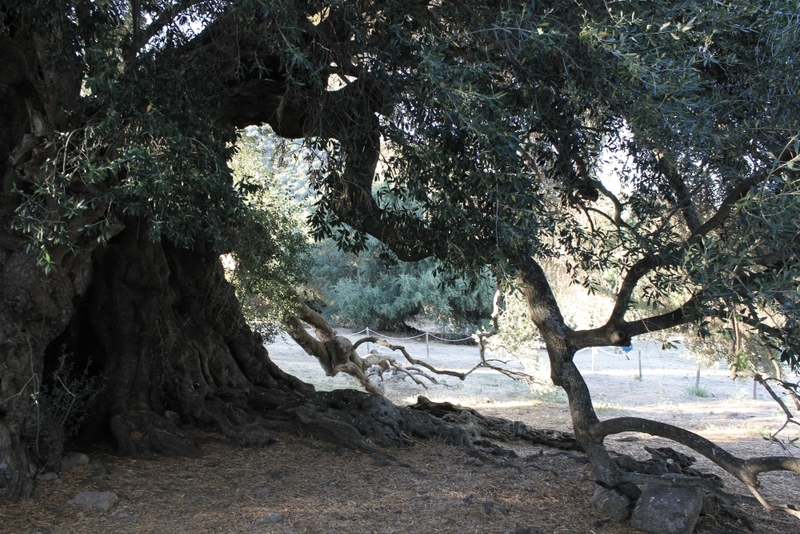 The Wild Olive Tree in Luras, more than 3000 years old! Tiziano Fratus is a columnist of national newspapers such as La Stampa and Il Manifesto, he is the voice of Nova Silva Philosophica, a radio programme dedicated to forests and natural literatures, he held conferences and walks and meditation. He constantly cross the country to meet trees and natural reserves and sometimes he travel abroad. Gardens of Villa Malfitano-Whitaker in Palermo. Tree Huggers could visit Italy to meet Monumental Trees. For example they could go to Lumbardy to see big American Red Oaks (Quercus rubra) in public gardens, Indro Montanelli in Milan or Real Park in Monza; they could visit caput mundi Rome to meet four hundred years old Oriental Planes (Platanus orientalis) in the park of Villa Borghese and in Botanical Garden. Or theu could prefare to fly to Palermo to admire biggest exotic trees of the continent (Ficus macrophylla), imported from the Australia in the XIX Century, at the Botanic gardens, in Piazza Marina, in the parks of historical villas as Trabia, Malfitano-Whitaker, Giulia and many others. Huge castanea sativa in Melle, Piedmont. Tree Huggers could visit the biggest Sweet Chestnut (Castanea sativa) of the globe, on the Vulcan Etna, in the little village of St. Alfio, with an age of 2500 years old (but someone promises a dizzy record of 4000 years old); some of the oldest olive trees (Olea europaea and Olea oleaster) in Europe, as for example in Sardinia: one monumental specimen around 3000-3500 years old outside the town of Luras, it is considered the italian oldest Tree! In Sicily, in Tuscany and in Puglia, where we have some specimens of 1000-1200 years old. Very huge Araucarias in Liguria, at the wonderful Hanbury Botanical Gardens near the border of France, or in the public parks of Genoa Nervi. In Liguria you could visit also the beautiful Museum-Library founded by Clarence Bicknell in 1888 where we have two monumental ficus, the same species of Palermo (but also in Cagliari, Reggio Calabria and in Sanremo). The north of the country is populated by very big sequoias (Sequoia sempervirens and Sequoiadendron giganteum), planted since the year 1848, high till 50 meters and with huge trunks, that the travelers could meet in sanctuaries, private and public parks, botanical gardens and other places in Valle d’Aosta, Piedmont, Liguria, Veneto, Lombardia, Trentino Alto Adige, Friuli Venezia Giulia, Tuscany and Emilia Romagna. The Alpin arch guests very big and spectacular larch (Larix decidua), especially in Pietraporzio (Piedmont), Morgex (Valle d’Aosta) and the three famous millennial in Val d’Ultimo – Ulten (Trentino Alto Adige) and carved pine trees (Pinus cembra). The talles tree in Italy is a douglasia (Pseudotsuga menziesii), 64 meters high, planted in 1916 in Arboreti Sperimentali of Vallombrosa (Tuscany). A secular beech in Palanfrè Wood, Piedmont. You could visit the old cypress (Cupressus sempervirens) planted by Saint Francesco in the year 1213, preserved carefully by friars in the cloister of the convent in Verucchio, near the beautiful Republic of San Marino, in Emilia Romagna. Or the big Oak (Quercus pubescens) visited by Carlo Collodi inspiring him during the writing of The Adventures of Pinocchio, at Capannori (Lucca). You could visit the Napoleone’s Plane (Platanus x acerifolia) outside the city of Alessandria, one hour far from Turin, planted after the victory in the battle of Marenco (1800) or the huge oriental Plane of One Hundred Soldiers (Platano dei cento bersaglieri) at Caprino Veronese, Veneto, near Garda lake. You could visit the park of Villa Verdi, in the plain of the north, where the famous composer Giuseppe Verdi dedicated a lot of time to plant trees as bald cypress (Taxodium distichum). Cedrus libani – One of the Italian largest specimen in Varese. But Italy is first of all a country popolated by beeches (Fagus sylvatica), our common wood is composed by beeches. And this means that we guest monumental specimens as very famous around Alps and Appennine Crest. Big oaks, chestnuts, pines, firs, limes, eucalyptus, cypress, elms, and also some fruit trees of 200 years old as pears and vineyards. A costellation of botanical gardens (Hortus academicus) with a so long history and extraordinary famous buildings with parks as Villa Taranto in Verbania (Lake Maggiore), Villa Olmo in Como (Lake Como), Villa Doria Pamphilj in Rome, Royal Palace of Caserta, Villa Demidoff outside Florence and so on. Pinocchio’s Oak: probably, maybe, possibly, the huge tree described by Carlo Collodi in his evergreen fairytale – Capannori, Lucca. 4 risposte a "Italy for Tree-Huggers"
What’s Happening i’m new to this, I stumbled upon this I’ve discovered It positively helpful and it has aided me out loads. I hope to give a contribution & aid different users like its aided me. Good job. A lot of times it’s very hard to get that “perfect balance” between user friendliness and appearance. I must say you have done a very good job with this. In addition, the blog loads extremely quick for me on Firefox. Superb Blog! Spiriti viventi a diretto contatto con la Verità!